You could place it onto a website, like this one. This is a great start! If everybody contributes, we could get a creature compendium filled up pretty fast. Add a column called "special ability attribute". While most specials are based on pwr, some aren't. 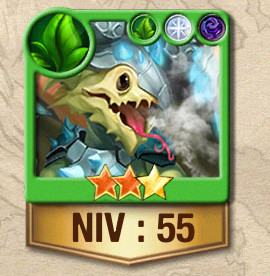 We need some way to add creature evolutions, maybe make the first column the base creature and on the second column the evolution. The special does get more powerful with evolution. Alternatively, we could put the name of the base creature in the frst column, the names of the evolutions on another and just list the special abilities for the max evolution, as this is the most relevant anyway and will avoid redundancy. Finally, a listing of the creatures base attributes on max lvl would be great. Maybe, you could create a working copy, so several people can work on this document? Edited by AxeTerio at 23:56, 26 Feb 2017. Of those pictured, how many dupes in total did they take, 27? Are the rewards listed in order in which they unlock? How many dupes did the Epics and Legendaries take at each reward level? That would be really cool, kinda thought those would be for the "pros"
Edited by Galaad at 00:03, 27 Feb 2017. What do you mean Affinity? Yes the rewards (assuming you refer to awakenings) are listed in order, from top to bottom like in the game. Sadly after you've awaken, it doesn't show anymore the number of dupes needed and I don't remember. Usually I think it's between 20-30 to fully awaken a creature. I think for Legendary it's less but I only have access to the Phoenix reqs right now, I'll add them later, before they disappear as it evolves. Nah, everyone can edit and contribute. Edited by AxeTerio at 01:05, 27 Feb 2017. Edited by hayenne at 09:49, 27 Feb 2017. BTW @AxeTerio, Manticore is yellow, I'll add the color dots next to the names when I get time. I just noticed how close does CQ's manticore resemble the one from HoMM 3 (without the upgrade). You really can tell the same guys developed the game! Edited by Galaad at 09:54, 27 Feb 2017. Gimme a screenshot (via HCM/Instant Message) if you have it I'll post it next to the fully evolved one for comparison. I'm always mesmerized by the creatures animations and effects around them, which we can't see in the screenshots. Total of 15 dupes to fully awaken. Edited by hayenne at 07:51, 01 Mar 2017. Looks like all Epic creatures have the same amount of creature cost to awaken, so we don't really need to mention them for all the creatures. UGH! Yeah! The Treant made ALL the difference in 49th. But consequential skill attacks from Succubus Queen and two Elemental Lords certainly did contribute. Still, in the end it was kinda like a lottery. Don't all creatures on a given tier have a set amount of awakening slots? It would be 27 for a Rare. Edited by AxeTerio at 20:23, 11 Mar 2017. There hasn't been any updates other than my own. The updates I did to the master sheet converted over to the Copy once so I thought it would keep working that way. I've done more updates (see above) to the master but they did not automatically convert over to the Copy one. Google sheets also doesn't update formatting when I copy/paste so keeping an extra sheet for others to view/update may not be effective. Tower 16 is a fantastic place to farm, added that to the OP. Edited by markmasters at 12:10, 14 Mar 2017. Even though I do not post here much don't think I don't use it, this is a great place and I reguarly look up where I can get a certain creature!. The google doc document is awesome thank you for that, I see I can't add stuff myself so you might soon get a request do update if I post here or do you prefer another way for it? Vampire (vampire lord, vampire overlord). stats (fully evolved and fully filled with totems): HP 11000, pwr 2415, atk 1700, def 1850, luk 1900, mp 135. Oh yeah I keep forgetting to say, lvl 12 is great for farming Dragonlings. Fully awakened ones are definitely worth it. Yeah, small creatures, not so trivial. Do they even appear on level 12? It's a white and green level. I usually only farm the levels when there is increased drop rates though. 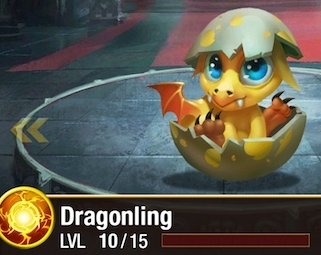 The creature you show is called "Horned Dragonling". I'll update the original post.